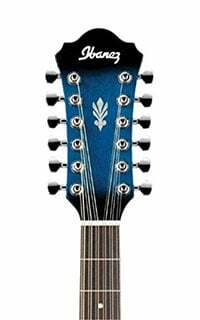 While Ibanez may not be as ‘elite’ as some niche brands in the acoustic guitar segment of the market, they are definitely one of the oldest and most experienced manufacturers. Their AEL152ETBS is easily among the most impressive 12 string guitars you can grab at the moment and here’s why. 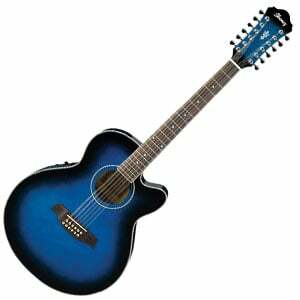 From the moment you first lay your eyes on this Ibanez, you will know it’s not just a regular acoustic guitar. And no, we are not talking about the additional strings. Ibanez sometimes goes above and beyond with their finishes and overall design. 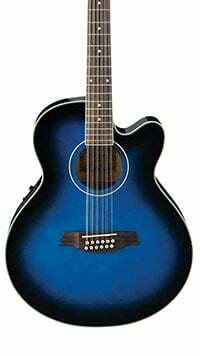 With AEL152ETBS, this comes in form of a really well applied transparent Blue Burst in high gloss. Add the white binding and you really have one powerful looking guitar. On one hand we can’t dispute the aesthetics, but on the other some might want to let that spruce top breathe, as well as those maple back and sides. In terms of build quality, there is really nothing to worry about. While these guitars aren’t necessarily handcrafted, Ibanez has one of the best production processes in the industry. Machining, tolerances and quality control are all at the highest possible level. In other words, these guitars are rock solid. Hardware is an interesting part of AEL152ETBS. Ibanez used a chunky rosewood bridge along with a synthetic nut/saddle combination. One particular aspect that really shows where Ibanez is at, are the bridge pins. Instead of using the standard long pins, Ibanez has designed a much more practical design. Their Advantage pins don’t reach as far as standard ones do, but they are much easier to operate without having any negative impact on the intonation or integrity of the guitar. With that said, tuning machines are a fairly standard chrome die cast units. There’s nothing exciting about them, but they do work. Ibanez AEL152ETBS comes with a built in preamp system. It is their own Ibanez AEQ­2T. Compared to other guitars in this price range, AEQ­2T actually stacks up pretty well. You get bass and treble adjustments, as well as volume control and a built in tuner. When it comes to sound, Ibanez delivers a very balanced performance. You could say that the guitar is acoustically tuned to perfection. Every note comes out clear, crisp but with plenty of warmth filling out the tone as you play. Projection, volume and definition are borderline impeccable for a factory guitar. This goes to show how much attention Ibanez invests into their quality control system. The preamp isn’t there to make AEL152ETBS sound like a whole different guitar. Instead, everything about it nicely complements the default settings. This is the type of guitar you can easily take to a gig or even serious stage work. It just keeps surprising in the value for the money regard. Those on a tight budget should absolutely check this Ibanez out. It is a very reliable platform to use as your main. Besides, chances are you will fall in love with it anyways. At the end of the day, Ibanez has delivered more of what we’re used to seeing from this brand. The AEL152ETBS is an outstanding guitar that perfectly balances the practical, functional and aesthetic factors. As such, we can easily recommend it to both beginners and intermediate players or even pros. For more info about the IbanezAEL152ETBS, click here.